The Very Rev Dr Angus Morrison describes the commemoration of the death of Michael Bruce. THIS year marked the 250th anniversary of the death, on July 6 1767, of the Kinnesswood-born Michael Bruce, affectionately known as The Gentle Poet of Loch Leven. The son of a hand loom weaver, Michael gave early promise of exceptional literary talent. Had he lived beyond the young age of 21, there is no doubt that the full flowering of his poetic talents would have led to national recognition. Robert Burns was influenced by a number of his lines. 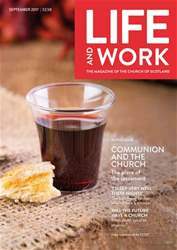 In this month's issue: COMMUNION AND THE CHURCH - The place of sacrament ‘I SLEEP VERY WELL THESE NIGHTS’ - The high flying banker who became a minister WILL THE FUTURE HAVE A CHURCH - From death spiral to phoenix? Will the future have a church?